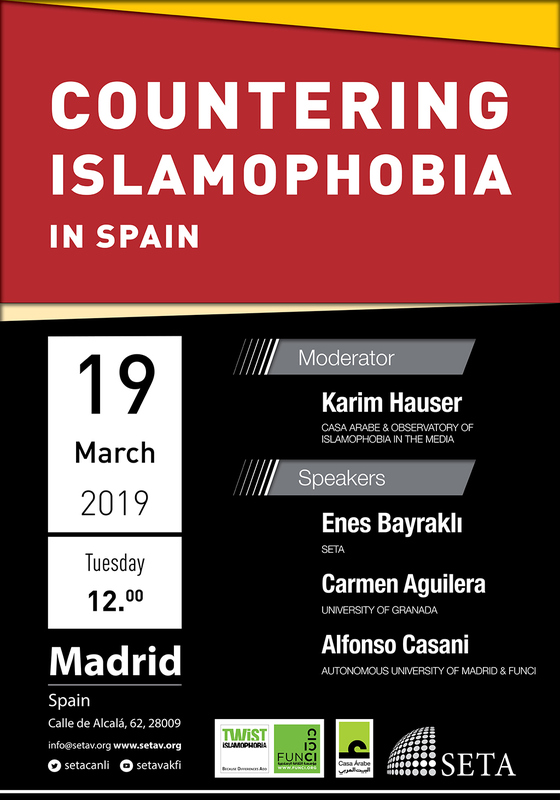 On March 19, 2019, Casa Arabe, in cooperation with FUNCI and SETA will organize the panel “Countering Anti-Muslim Racism in Spain” at Casa Arabe Institute, Madrid. Drawing on the most recently published edition of the annually published European Islamophobia report, this event will shed light on the rising levels of Islamophobia in European countries and Spain. Additionally, the event seeks to address the issue of tackling this growing phenomenon. Karim Hauser, the responsible of International Politics in Casa Arabe, will moderate the discussion in company of Enes Bayraklı, the director of European studies at SETA and co-editor of the European Islamophobia Report, Alfonso Casani, Researcher at the Foundation of Islamic Culture (FUNCI), and Carmen Aguilera, author of the Spain chapter of the European Islamophobia Report 2017.